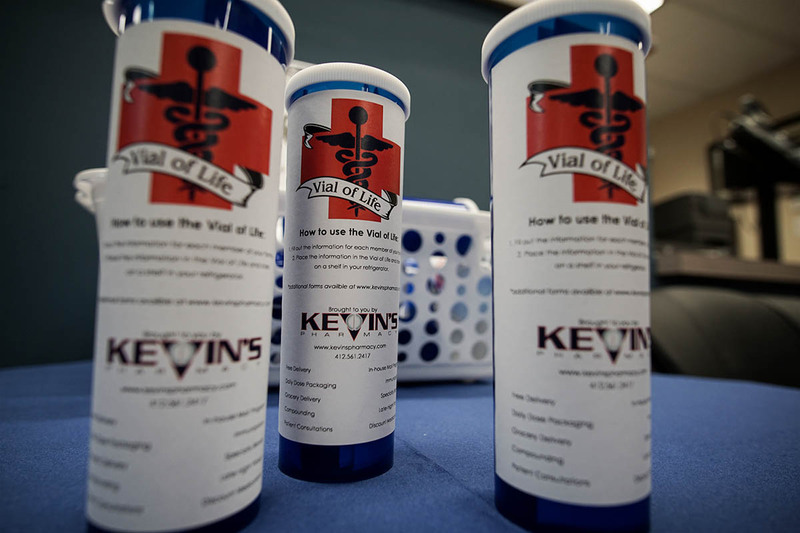 We’re proud to announce that the Vial of Life program has come to Kevin’s Pharmacy. This program provides you with a medical vial that contains your medication information, medical history, hospital preferences, and more. Once you record your information, you place it into the vial and keep the vial in your refrigerator. The South Hills Paramedics have been trained to look in your refrigerator in the case of emergency, allowing the effortless communication of your medical history and needs to paramedics during what may be a rather difficult time to communicate this information yourself. The vials are free and available to the public through the pharmacy. Thomas Tritinger, one of the Pharmacists here at Kevin’s Pharmacy in Castle Shannon, is leading the initiative to give South Hills communities access to a life-saving Vial of Life program. “The program concept is so simple, but people simply need to be aware of it. Anyone can take advantage of it for themselves and their loved ones. These vials really can save lives, and I encourage everyone to participate,” Tritinger commented. With the goal of supplying the citizens of Pittsburgh with these life-saving vials, businesses, institutions, and community leaders interested in joining us as collaborators in the project can easily get involved and are encouraged to do so. Please feel free to contact us if you are interested in providing the Vial of Life to your organization’s members. If your medical information has changed and you’d like to update your information, please click here to download and print a new form for your Vial of Life.